Download "United Security Alliance, Inc. Specialists in Video Surveillance Solutions Nationwide Since 1985"
3 results in conjunction with after-hours video monitoring and forensics. 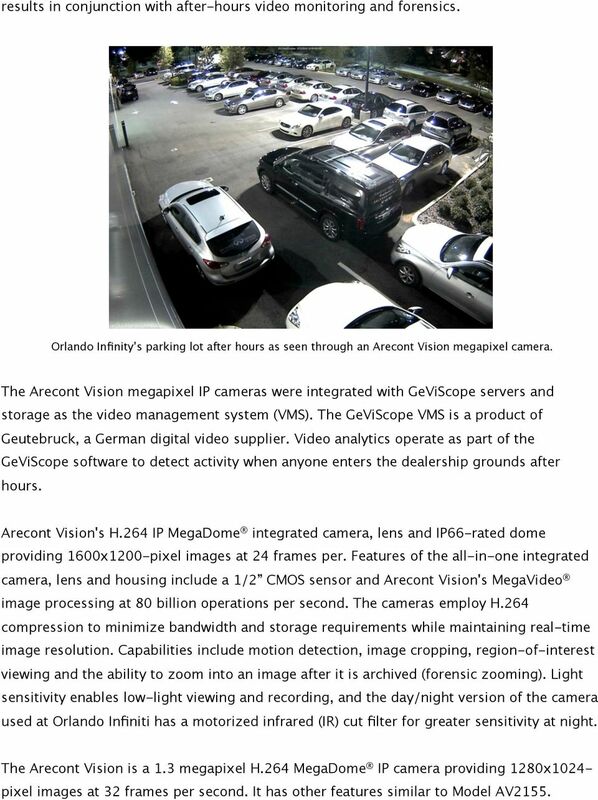 Orlando Infinity s parking lot after hours as seen through an Arecont Vision megapixel camera. 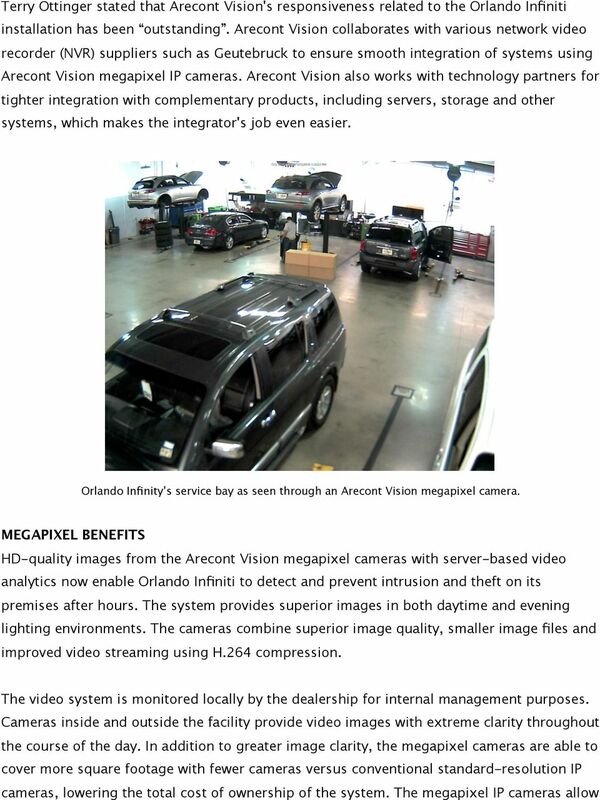 The Arecont Vision megapixel IP cameras were integrated with GeViScope servers and storage as the video management system (VMS). The GeViScope VMS is a product of Geutebruck, a German digital video supplier. Video analytics operate as part of the GeViScope software to detect activity when anyone enters the dealership grounds after hours. Arecont Vision's H.264 IP MegaDome integrated camera, lens and IP66-rated dome providing 1600x1200-pixel images at 24 frames per. Features of the all-in-one integrated camera, lens and housing include a 1/2 CMOS sensor and Arecont Vision's MegaVideo image processing at 80 billion operations per second. The cameras employ H.264 compression to minimize bandwidth and storage requirements while maintaining real-time image resolution. Capabilities include motion detection, image cropping, region-of-interest viewing and the ability to zoom into an image after it is archived (forensic zooming). 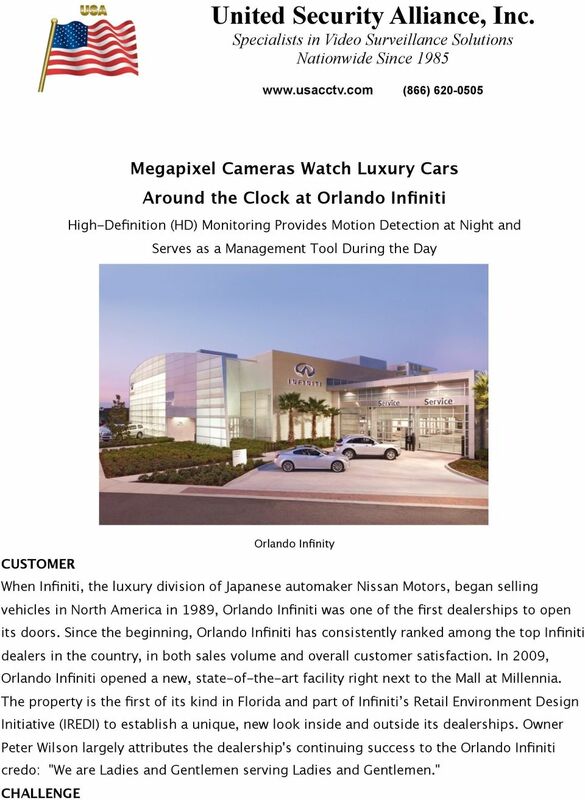 Light sensitivity enables low-light viewing and recording, and the day/night version of the camera used at Orlando Infiniti has a motorized infrared (IR) cut filter for greater sensitivity at night. The Arecont Vision is a 1.3 megapixel H.264 MegaDome IP camera providing 1280x1024- pixel images at 32 frames per second. It has other features similar to Model AV2155. 5 management to zoom in on specific areas of live or archived video to see important details such as a license plate number. L to R: Orlando Infinity parking lot view during the day, parking lot view after hours as seen through an Arecont Vision megapixel camera. After hours, the system and its high-quality Arecont Vision megapixel IP video images are monitored remotely by United Security Alliance's Central Station. Any individuals entering the premises are detected and trigger a video analytics alarm, allowing central station operators to clearly see intruders on the lot after hours and to respond quickly to prevent theft and losses. 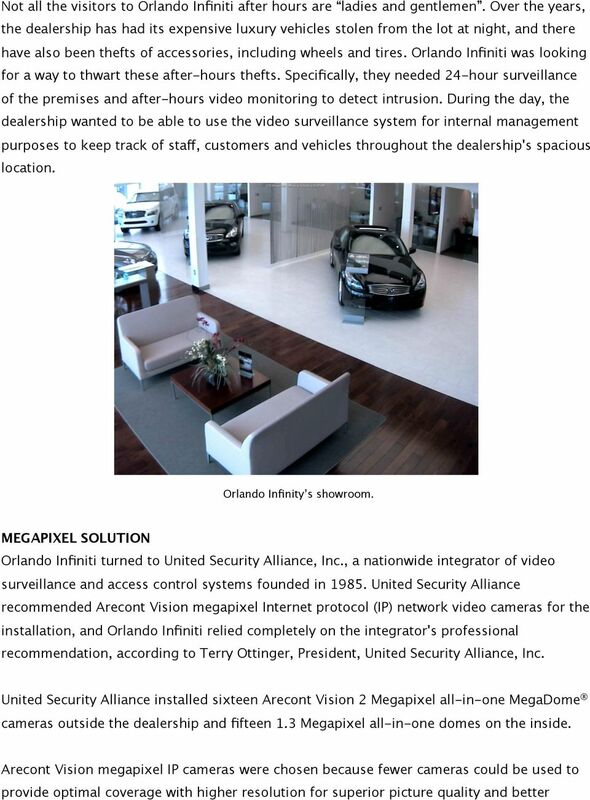 On a number of occasions, the central station has detected individuals on the premises in the middle of the night and been able to speak to them through an interactive audio system to let them know the premises are under surveillance, the facility is closed and they should leave the facility immediately, said Peter Wilson, Owner, Orlando Infiniti. This has obviously prevented potential criminal activity and saved the facility an unknown sum of money that could have resulted from losses and damage to vehicles on the property. In fact, the system has performed flawlessly to date. Based on the sticker prices on the windows of the luxury vehicles, it's safe to say the prevented losses would total many thousands of dollars. 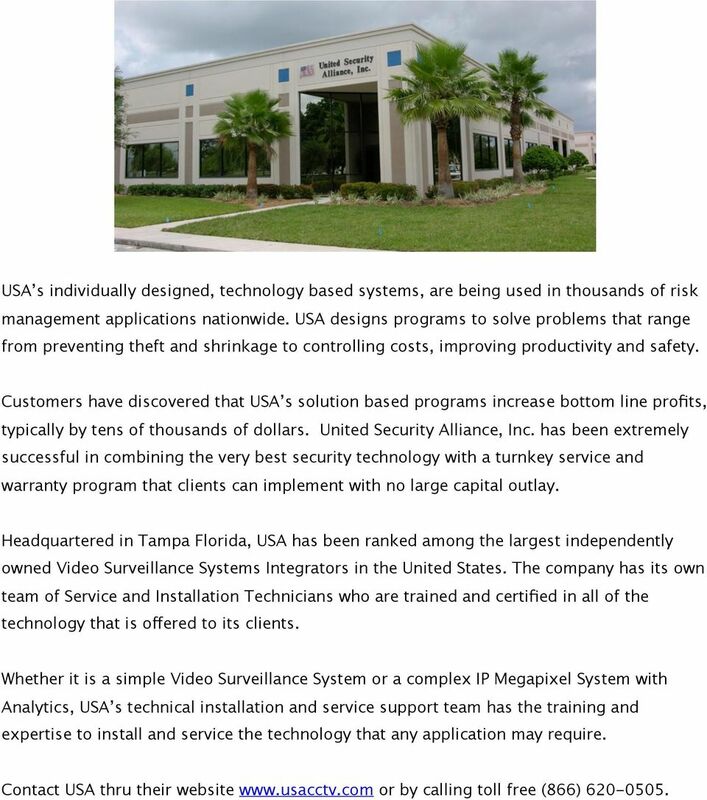 ABOUT UNITED SECURITY ALLIANCE Since 1985, United Security Alliance, Inc. (USA) has been an industry leader in the design, installation and service of Video Surveillance and Access Control Systems. The benefits need to be seen to be believed! Axis IP surveillance. Endless possibilities for video surveillance. The camera shall be based upon standardised components and proven technology generally using open and published protocols. Our focus is on 24/7 remote access and camera control Dynamic Transcoding 24/7 remote access and control anytime, anywhere Limited bandwidth used to make it impossible to stream HD video on mobile devices. Intelligent security; intelligent data intelligent management solutions Intelligent IP Security for a Connected World. www.ifacility.co. Panasonic Video Surveillance Solutions One Partner. One Solution. Transportation. The road to smarter traffic monitoring with Axis network video solutions. Surveillance, Security & CCTV: A Buyer s Guide -2- SECURITY SURVEILLANCE SYSTEMS Security surveillance equipment, more commonly referred to as CCTV equipment, is not just for large corporations anymore.